Although ivory is not found on contemporary furniture following strict trading laws in endangered flora and fauna, restorers and conservators still occasionally come into contact with the material due to its former popularity. 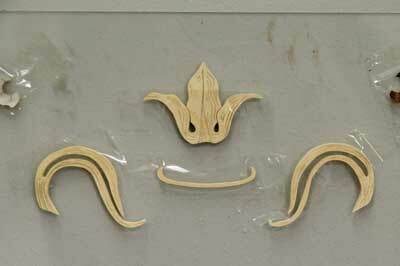 When ivory repairs in antique furniture are needed it can be a tricky situation, some genuine pieces can be carefully acquired or more preferably, an artificial substitute is put in its place. The Convention of International Trade in Endangered Species (CITES) has declared that antique worked specimens of ivory acquired before 3/7/1947 may be used without a certificate and only worked specimens may be internationally imported and exported following international trading regulations. Despite the preservation of design heritage making some exceptions in the handling of ivory, when faced with the challenge of reproducing a marquetry panel that included a substantial quantity of ivory, there was no justification for using the genuine material. Instead I had to look elsewhere for a more sensitive material and soon found myself busy making excesses of artificial ivory substitute. There is an increasing amount of artificial materials coming onto the market to meet the demand of precious and protected materials in furniture restoration. Buying these materials can be the easiest option, however it is important to remember that the natural materials will not be uniform in texture or colour, no two pieces are the same. Manufactured substitutes are standardised for ease in production. Making your own can allow for alterations in the composition to subtly adjust the look of each individual segment. If you are looking to identify whether a piece of antique furniture has been inlaid with ivory or bone, examine the texture of the material. Ivory will have a slight ripple to the surface, indicating the growth of the elephant tusk whereas bone is very porous so will have lots of tiny pin pricks. Magnification equipment may be necessary as this detail is often far too small to see with the naked eye. When using West Systems epoxy resin, be sure to work in a well-ventilated area to combat the fumes produced. It is advisable to wear gloves as well; the ingredients will get very messy. When manipulating the final material you should be working near eye level so that you can see your work and avoid neck strain. Due to being in close proximity to the 'ivory', the dust produced is likely to irritate your eyes and throat so wearing protective glasses and a mask is recommended. When cutting the ivory substitute with a piercing saw or scalpel, avoid positioning your fingers in the direct line of the blade. It was suggested that I look at exploring the possibility of creating my own artificial ivory substitute; this way I could fulfill the essential attributes in colour, thickness and quantity for the project. Using West Systems' two-part epoxy resin combined with a bulking agent seemed like a good starting point. I was familiar with the amalgamation of epoxy resin and Microlight, although I could presume that the texture produced would be suitable, the colour definitely wasn't. I needed to either add pigment or test another bulking agent. Given the natural whiteness in the colour of whiting - chalk - I decided to see how this would mix with the resin. Although the colour was slightly too cold, more significant was how difficult stirring the ingredients together was. 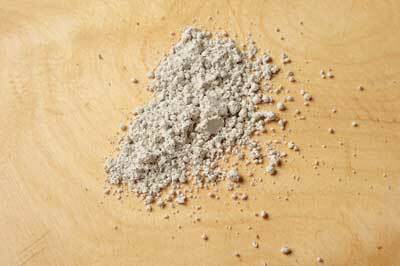 The texture being produced was lumpy and despite large quantities of whiting being added, there was too much of a shine to the mixture. This indicated surplus hardener in the ratio and consequently the material took upwards of three days to dry and at the end the surface was very difficult to manipulate. I decided to go back to using Microlight and explore adding pigment. I began with making up a composition of resin and Microlight and adding enough titanium white pigment to get the colour as pure as possible. This was left to dry and afterwards I sampled cutting and incising the surface. 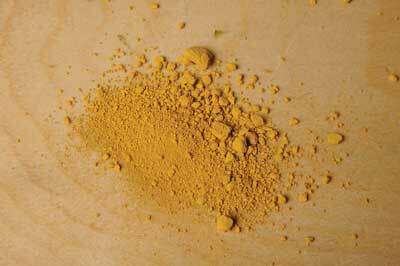 Once I established this was successful, I experimented with adding yellow ochre, golden yellow and dark brown pigments to produce a range of colours, but some were too yellow and others too white for the shade that I hoped to obtain. Many of the combinations were also far too paste like in consistency, therefore I cut down the quantity of Microlite as well as dividing up the introduction of materials to help reduce its density. I intended the 'ivory' to give the impression of being very fresh and light. Eventually a matching colour was found. After much experimentation and deliberation over the composition, measurements and colour of the artificial ivory substitute, I have finally devised a method to make approximately 100 x 100mm of 'ivory' at 3mm thick. I have matched the colour to an existing piece of unused ivory, therefore the hue is very light. 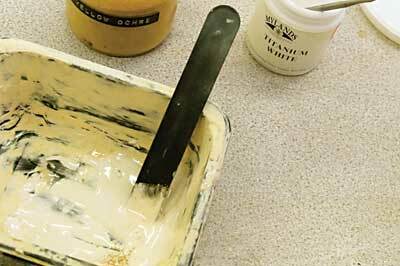 If a more yellowed/older colour is required then simply add more yellow ochre pigment. Measure out 5g of West Systems epoxy resin, then pour into a disposable container with one scoop of Microlight and mix thoroughly. 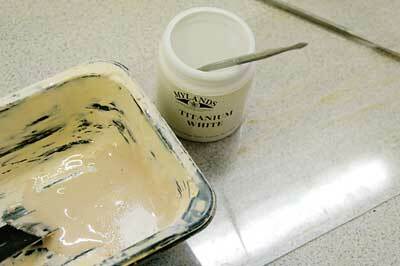 Stir in six spatulas of white titanium pigment until the mixture is even. 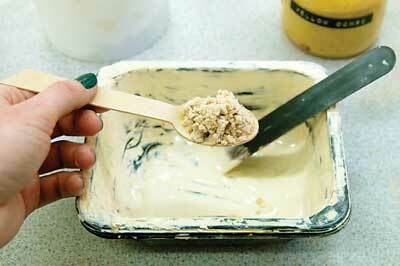 Add in half a spatula of yellow ochre pigment and another scoop of Microlight. 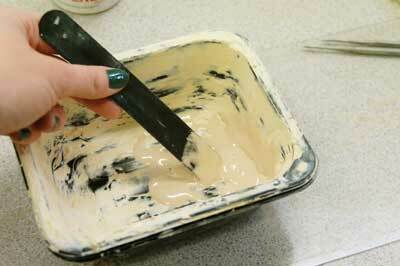 Stir once more and alter the levels of pigment according to the colour you want to achieve. Pour in 1g of West Systems hardener and half a scoop of Microlight. Mix until the texture is smooth and the colour even. Using a spatula or palette knife, flatten the mixture out onto a thin and flexible piece of plastic and leave to dry for at least a day. 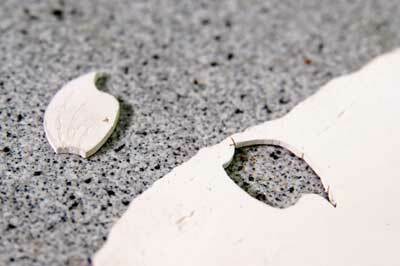 Once set, gently bend the plastic away from the 'ivory' to extract your new material; be careful not to let it crack. West Systems dries incredibly hard and if it is left to dry on any other surface it will need to be chiselled off. This method of introducing the ingredients in stages allows for a smooth texture to be created and for an even colour to be produced. 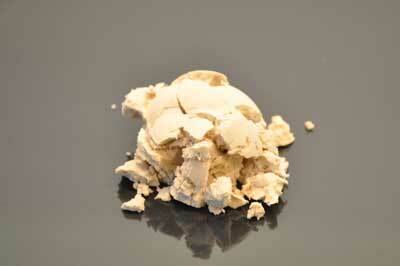 When using pigments, remember it is easier to darken a light colour than it is to lighten a dark one. The hardener is added during the very end stage to avoid any worry of the mixture drying out whilst you are still working on the composition. The application of West Systems epoxy resin and Microlight is a contemporary technique practised by restorers to consolidate hidden timber that has suffered tack damage in upholstered furniture. It is important not to have the composition too shiny as this means it will dry incredibly hard, when new tacks are applied the mixture will merely crack. 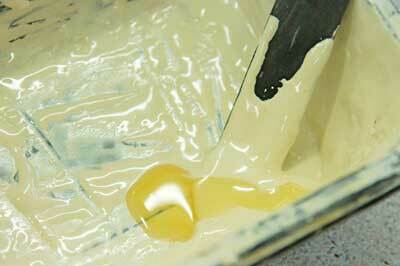 The aim is to get a consistency of clotted cream; the ratio of 5:1 - epoxy resin: hardener - is advisable. 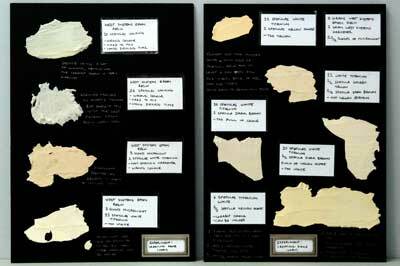 This composition could also be used to replicate bone as well as ivory. 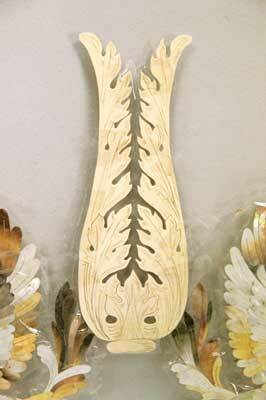 The beauty of the finished material is that it can be manipulated and cut in exactly the same way as genuine ivory. However, the consistency is a lot softer so when cutting with a saw it is important to go very slowly to avoid the blade slipping and going straight through the wrong section. The artificial substitute will also heat up very quickly if there is too much friction caused by fast movement. 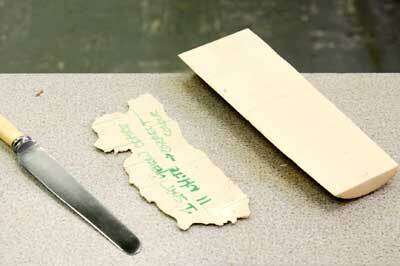 As the material is so delicate it is possible to also cut with a scalpel. 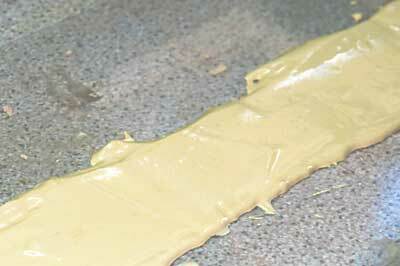 Sandpaper can be used to smooth down any rough edges or to adjust the thickness. Once you have removed your 'ivory' from the plastic it will be very shiny on the backside, choose this as your topside due to it being exceptionally flat. Sand down to take off the sheen and leave a matte surface. 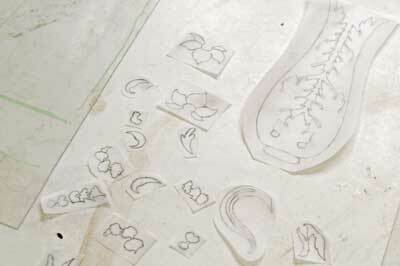 To cut specific shapes from your material, either draw directly onto the surface or onto a piece of tracing/fax paper. On genuine ivory this could then be spray mounted onto the piece, however the texture of your artificial ivory will not allow for this. 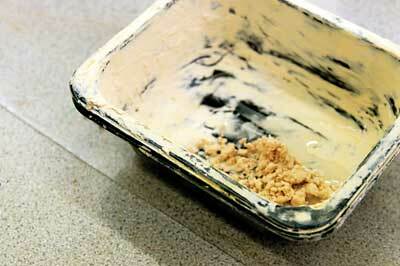 Sellotape your design on but make sure to wipe down the area to expel any dust that will prevent an adhesion. 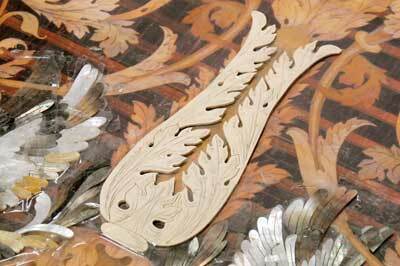 Incising the material is very easy - crafting tools or a scalpel are ideal for carving out decoration on the surface. 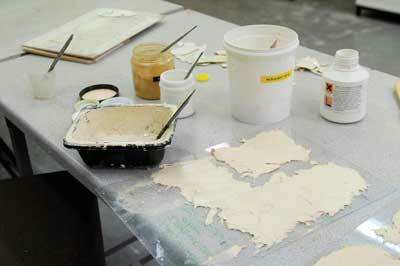 You can then glue the 'ivory' to the desired groundwork with the traditional method of protein glue. Although this is not an essential step, it is possible to then go over the artificial ivory with a finish if one is being applied to the entire piece of inlay.